David Claerbout, 'KING (after Alfred Wertheimer’s 1956 picture of a young man named Elvis Presley)' (detail), 2015-16. 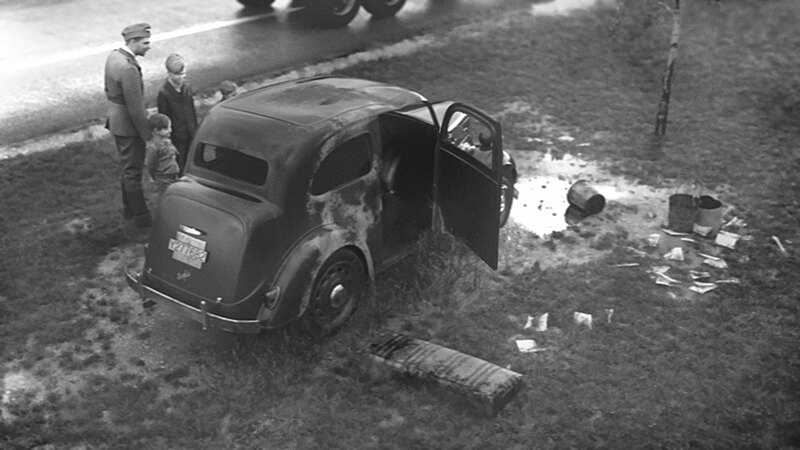 Single-channel video projection, HD animation, black-and-white, silent, 10-minute loop. Courtesy of the artist and galleries, Sean Kelly, New York and Micheline Szwajcer, Brussels. Due to open on April 13th at the Parasol unit foundation for contemporary art in London, the exhibition “Magical Surfaces: The Uncanny in Contemporary Photography” is curated by Ziba Ardalan and deals with the uncanny as evoked by the work of seven contemporary artists from two generations. Although each of these artists explore different themes and use different techniques, all of the works showcased at the exhibition present something both otherworldly and familiar that conjures a feeling of unease. Freud described this in his 1919 essay The Uncanny as “that class of terrifying which leads back to something long known to us, once very familiar”; all seven of the exhibition’s artists exploit this quality in one way or another by blurring the distinction between reality and fantasy through the medium of photography. David Claerbout, 'Highway Wreck' (suite), 2013-2016. Single-channel video HD animation, black-and-white, silent, on flatscreen, two inkjet prints, Rag Photographique paper, 310 mg/m2, on aluminium, 62 x 109 cm / Screen 117 cm. Courtesy the artist and galleries Sean Kelly, New York, Micheline Szwajcer, Brussels, and Esther Schipper/Johnen Galerie, Berlin. Elger Esser, '33 Saint-Jean-de-Luz', 2008. C-print, hand-coloured, Alu Dibond, Forex, Unique, 180 x 281 cm / Framed 184 x 285 x 4 cm. Private collection © Elger Esser 2016. Courtesy the artist. 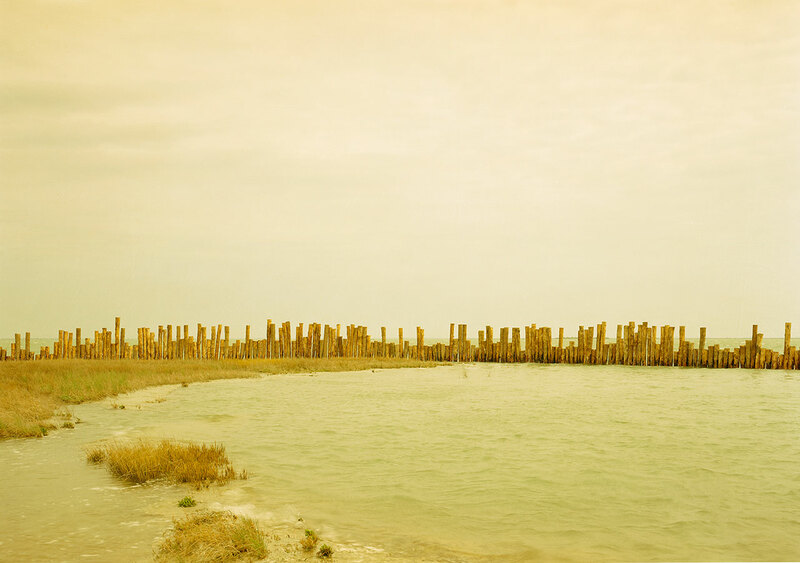 Elger Esser, 'Santa Caterina II Italien', 2002. C-Print, DiaSec Face, Edition 1/7 + 1AP, 136.5 x 180 cm / Framed 140.5 x 184 x 5 cm. Private collection © Elger Esser 2016. Courtesy the artist. Working at the intersection of photography and film, Belgian artist David Claerbout explores the passage of time by visually expanding the momentary. In his 2015 piece “KING (after Alfred Wertheimer’s 1956 picture of a young man named Elvis Presley)” he has digitally reconstructed a 1950s black-and-white photograph of Elvis using fragments of hundreds of original photographs of his skin in an eerie three-dimensional projection that zooms in and out allowing viewers an unprecedented proximity to the star. Düsseldorf-based Elger Esser’s work also deals with time, in his case, the search for lost time. Inspired by postcards which have fascinated him since childhood, his work revolves around the experience of travel. 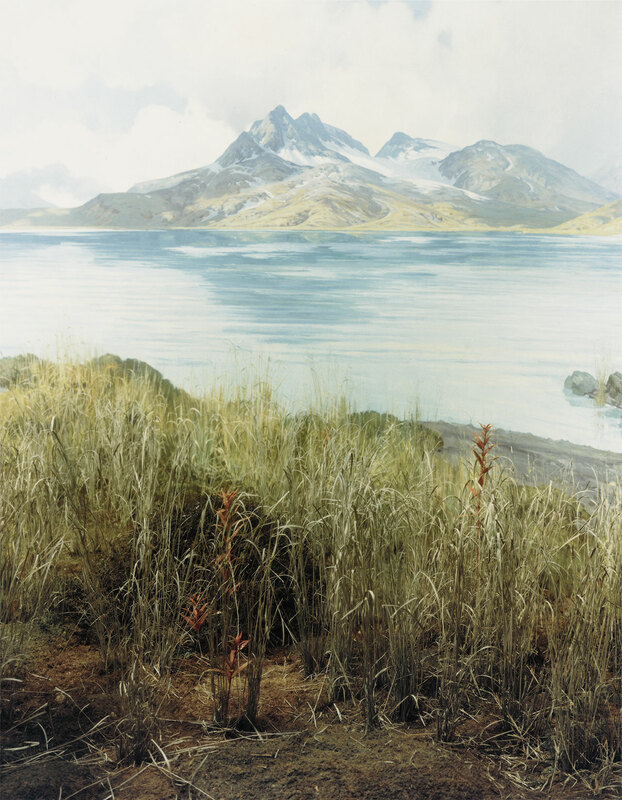 His images, large-scale enchanted land and seascapes—or “states of mind” as Esser calls them—are meticulously constructed by superimposing Chromogenic prints and héliogravures, eliciting a nostalgia that taps into the viewer’s past, provoking a longing for meaning. Julie Monaco, 'MC_01/05', 2006. C-print on aluminium, Diasec, Edition of 3 + 2 AP, 75 x 150 cm. Courtesy Galerie Ernst Hilger, Vienna. Sonja Braas, 'Firestorm' from 'The Quiet of Dissolution' series, 2008. C-print, Diasec, frame, Edition of 8 + 2 AP, 160 x 200 cm / Framed 170 x 210 cm. Courtesy Fabian & Claude Walter Gallery, Zurich. 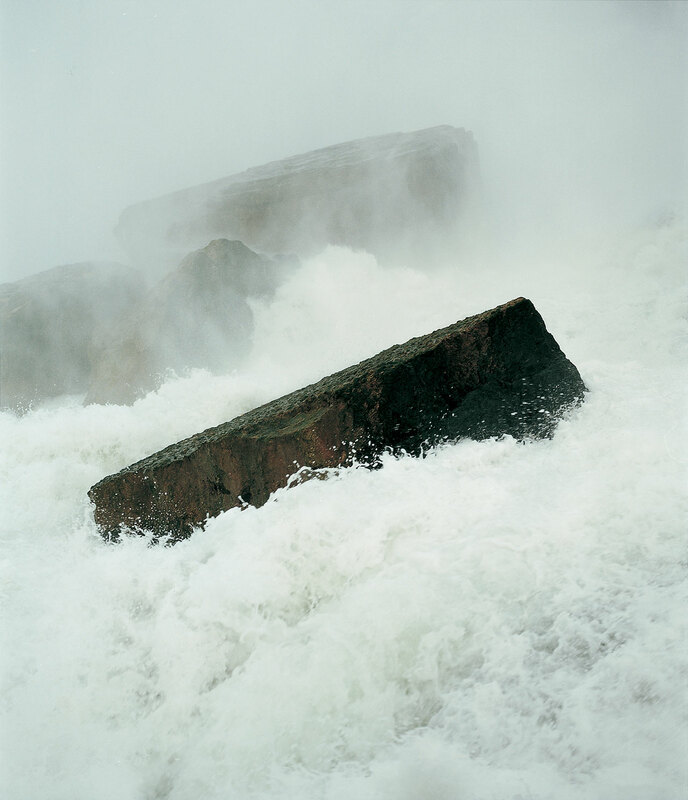 Sonja Braas, 'Forces # 1', 2002. C-print, Diasec, frame, Edition of 8 + 2 AP, 144 x 127 cm / Paper167 x 147 cm / Framed 170 x 150 cm. Courtesy Fabian & Claude Walter Gallery, Zurich. Julie Monaco, 'cs_02/4', 2005. C-print on aluminium, Diasec, Edition of 3 + 2 AP, 112 x 200 cm. Courtesy Galerie Ernst Hilger, Vienna. Seascapes are also the purview of Vienna-based artist Julie Monaco but in her case, they eschew romanticism for cinemascope-like abstraction. Her images, realistic as they first appear, are wholly computer-generated based on fractal algorithms, numerical codes and other computational tools, amplified by both digital and analog layering and overlapping. The mesmerizing result of this process which bridges the fields of painting and photography is the creation of a completely artificial reality of gloom. Combining Elger Esser’s romanticism of nature with Julie Monaco’s contrivance, New York-based Sonja Braas’ “Forces” series depict nature at its most dramatic although many of the images are of models built by the artist and photographed in the studio. The absence of any point of reference forces viewers to make their own assumptions and distinguish between what’s real and what’s not. 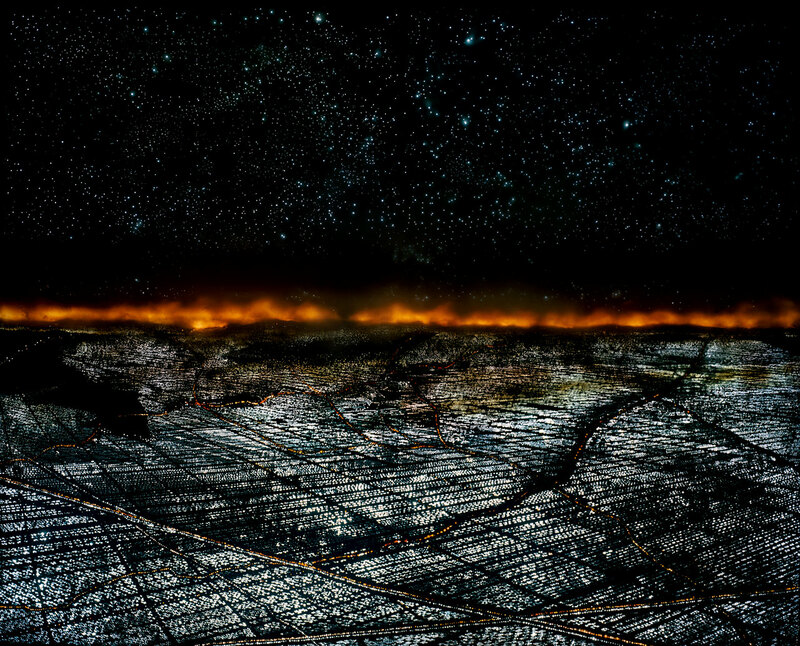 Similarly questioning the power of documentary photography, German artist Jörg Sasse, one of the first artists to use computer technology, digitally manipulates found footage—usually land and cityscapes—in order to imbue a magic realism that both obscures and questions the picture’s authenticity. Jörg Sasse, '1563', 2007. C-Print, Diasec, 100 x 180 cm. Courtesy of the artist and 303 Gallery, New York. Sonja Braas, 'You Are Here # 5', 1999. C-print, Diasec, Edition of 5 + 2 AP, 122.5 x 100 cm. Courtesy of DZ Bank Art Collection. Jörg Sasse, '2729', 2012. 12-colour inkjet print, Diasec, 108 x 200 cm. Courtesy of the artist and Galerie Wilma Tolksdorf. One generation older than the rest of the artists whose work features in the exhibition, American photographers Stephen Shore and Joel Sternfeld travelled independently across the USA in the 70s, photographing ordinary and banal settings in such evocative compositions as to reveal a hidden, uncanny dimension. Using Kodachrome film and 35-mm cameras, they were pioneers of colour photography using colour “to provide”, as Sternfeld explains, “some level of abstraction that can take the image out of the daily”. And indeed, their images, like those of the younger artists on display, imbue the familiar with the dream-like, tapping into the viewers' subconscious, thus enabling them to project their fears, anxieties or longings onto them. 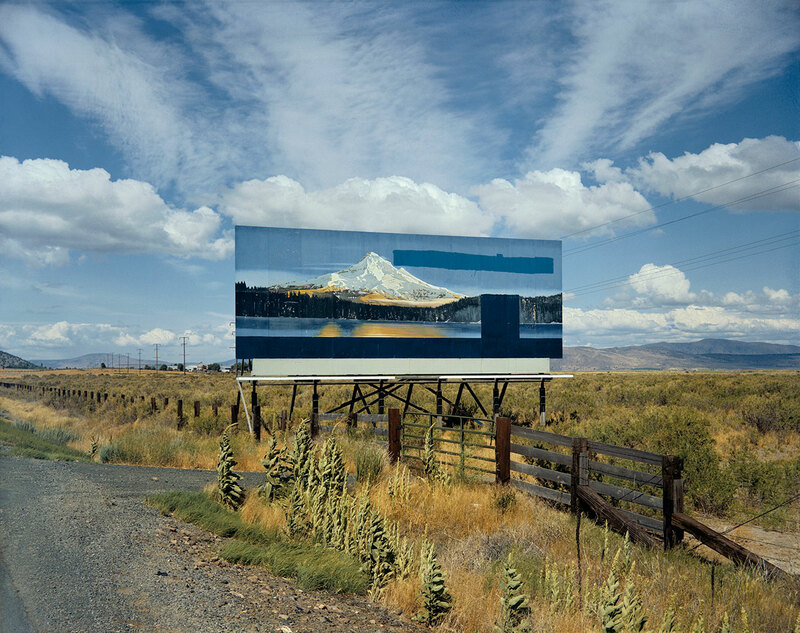 Stephen Shore, 'U.S. 97, South of Klamath Falls, Oregon, July 21, 1973', 1973 (printed 2002). C-print, Edition of 8, 43.2 x 55.2 cm / Paper 50.8 x 61 cm / Framed 59 x 68 cm. Courtesy of the artist and 303 Gallery, New York. 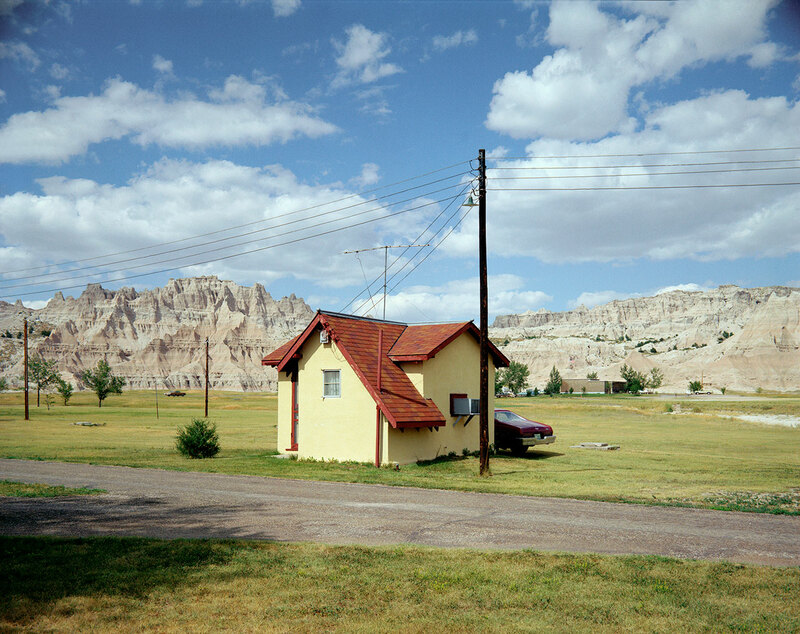 Stephen Shore, 'Badlands National Monument, South Dakota, July 14, 1973', 1973 (printed 2014). C-print, Edition of 8, 43.2 x 55.2 cm / Paper 50.8 x 61 cm / Framed 59 x 68 cm. Courtesy of the artist and 303 Gallery, New York. 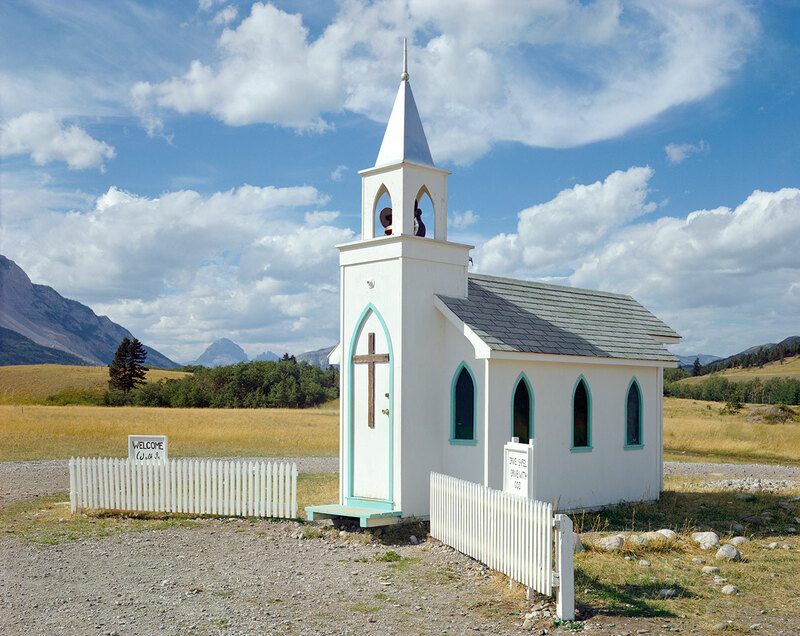 Stephen Shore, 'Bellevue, Alberta, August 21, 1974', 1974 (printed 2014). C-print, Edition of 8, 43.2 x 55.2 cm / Paper 50.8 x 61 cm / Framed 59 x 68 cm. Courtesy of the artist and 303 Gallery, New York. Stephen Shore, 'Brownsville, Tennessee, May 3, 1974', 1974 (printed 2014). C-print, Edition of 8, 43.2 x 55.2 cm / Paper 50.8 x 61 cm / Framed 59 x 68 cm. Courtesy of the artist and 303 Gallery, New York. 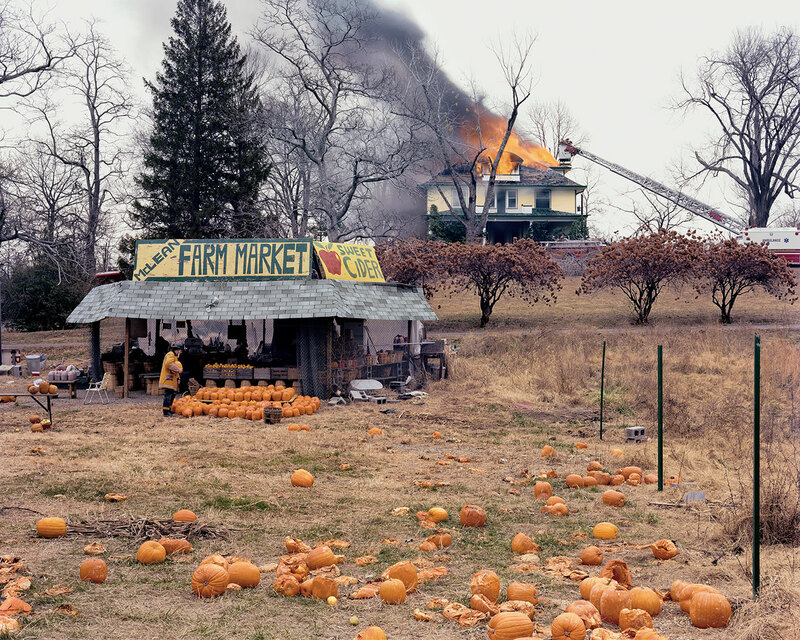 Joel Sternfeld, McLean, Virginia, December 1978, 1978 (printed 2003). Digital c-print, Edition of 10 + 2 AP, 106.7 x 133.3 cm / Paper122 x 148.6 cm / Framed 125.9 x 153 x 5.7 cm. Zabludowicz Collection © Joel Sternfeld; Courtesy of the artist and Luhring Augustine, New York. 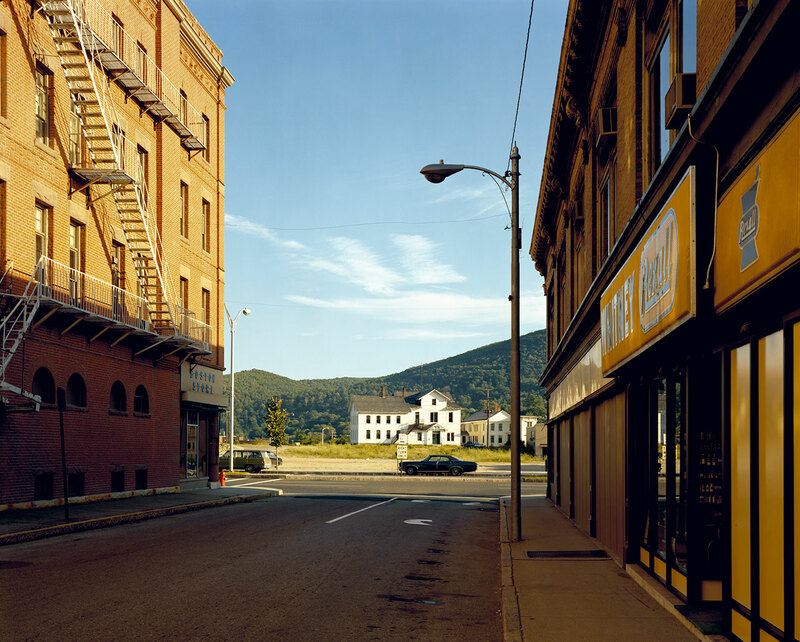 Stephen Shore, 'Holden Street, North Adams, Massachusetts, July 13, 1974', 1974 (printed 2014). C-print, Edition of 8, 43.2 x 55.2 cm / Paper 50.8 x 61 cm / Framed 59 x 68 cm. Courtesy of the artist and 303 Gallery, New York. 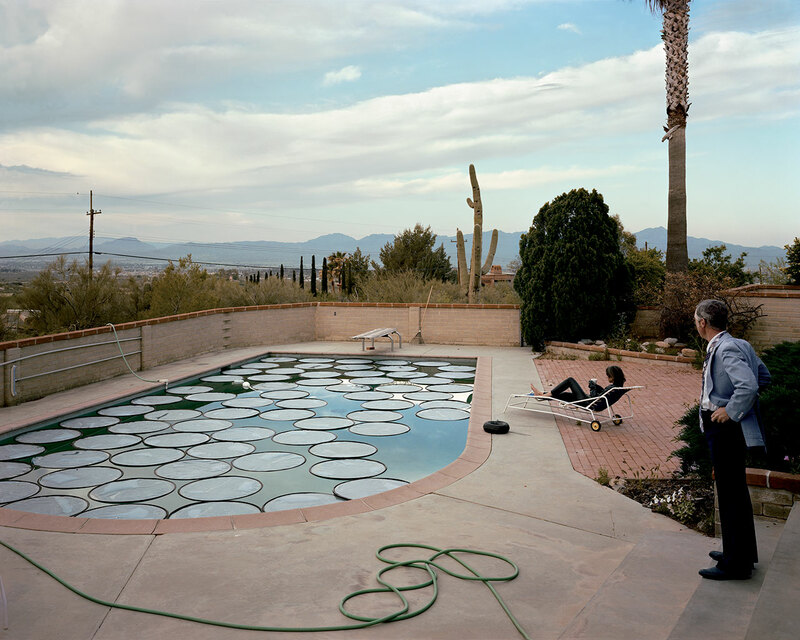 Joel Sternfeld, 'Solar Pool Petals, Tucson, Arizona, April 1979', 1979 (printed 2010). Digital c-print, Edition of 10 + 2 AP, 106.7 x 133.3 cm / Paper 122 x 148.6 cm / Framed 125.9 x 153 x 5.7 cm. Courtesy of the artist and Luhring Augustine, New York.